“With the opening of the new Customer Care Center in Friedrichshafen, we have established another milestone for our customers,” said Andreas Schell, CEO of Rolls-Royce Power Systems, at a ceremony to open the new facility on 16 May. Since January, MTU experts working across three locations – Singapore, Novi and Friedrichshafen – have been providing round the clock support and ensuring that customers get the optimum levels of availability from their MTU propulsion and energy systems. The new Customer Care Centers are part of a drive by Rolls-Royce Power Systems to transform its global customer service, with digitisation playing a key role. Rolls-Royce Power Systems has geared itself up for digitisation. An in-house team of more than 40 has been joined by employees from across the business, external experts, service providers from the start-up field and app developers; all driving ahead with the digital transformation process. With the aid of digitisation, Rolls-Royce Power Systems is linked more closely to customers and, by analysing additional information obtained from field engineers, generates added value for customer support, product development and quality, as well as for the international network. The first digital products – MTU-Go!Act and MTU Go!Manage – were designed specifically for individual applications and to meet customer needs, regardless of whether they are used for ships, trains, dump trucks or power generation. Connecting up the customer’s system to a ‘data logger’ enables MTU experts and the customer to remotely monitor the performance of engines; schedule maintenance work and ensure the availability of required spare parts needed; analyse operational data; and determine what actions to recommend. In addition, the Digital Solutions team, together with colleagues in IT, ensure that all the technical requirements, such as cloud infrastructure, data management and digital links are in place. “In all these considerations, cyber security and data protection have been assigned the highest priority. This is an area where we also benefit from the experience gained in the course of the last 20 years by Rolls-Royce in the aerospace industry,” Winterholler added. “As a result of the interplay between our new service agreements, new digital tools and the Customer Care Centers, the customer is provided with a complete peace-of-mind package,” said Matthias Vogel, Executive Vice President Service, Network and Business Development at Rolls-Royce Power Systems. The processing of service agreements is also integrated into the new Customer Care Center in Friedrichshafen, where experts work side-by-side with the digital team. Preventative maintenance work is scheduled to ensure that everything runs smoothly. Maintenance intervals are coordinated and an optimized, transparent cost structure is in place, guaranteeing the reliability and availability of engines and systems. Customers receive full service support, which is organised by both the new Customer Care Center and the proven Customer Assistance Center. For the UK‘s Intercity Express Programme, Rolls-Royce Power Systems is currently delivering a total of 360 MTU PowerPacks for 122 Hitachi trainsets. Under the Value Care Agreement, MTU guarantees the availability of these drive systems for the coming 27.5 years. The PowerPacks are equipped with data loggers to enable both MTU and the manufacturer of the trainsets, Hitachi, to jointly monitor the performance of the drive systems. Personnel from MTU UK will carry out the maintenance of the PowerPacks, supported by up-to-date sensor data, in Hitachi depots to ensure reliability. The digital tools MTU Go!Act and MTU Go!Manage from Rolls-Royce Power Systems provide analysis of connected systems. 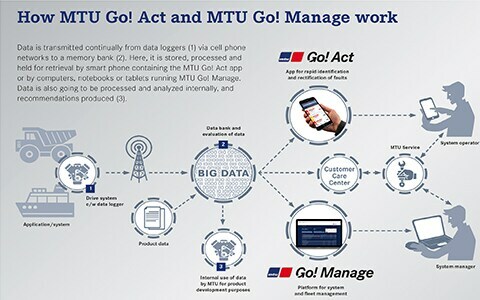 MTU Go!Act for smartphones alerts customers to any faults that may have arisen in connected systems and enables them to identify and eliminate the fault quickly. Details of faults can also be sent to a supervisor or specific team. 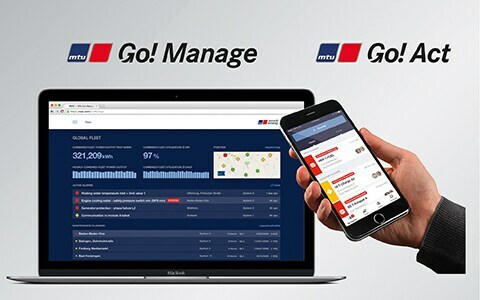 MTU Go!Manage is a platform that links up a customer’s system to Rolls-Royce Power Systems and significantly improves communication with MTU partners, distributors and the Customer Care Center. The operation and status of connected equipment is continually monitored and visualised, so that the operator and service and maintenance experts can respond quickly in the event of any irregularities and ensure that the system operates efficiently and reliably – helping Rolls-Royce Power Systems to deliver on its Value Care Agreement. Chained to Desk.com? It’s Time to Move on!